The firm or firms to which they made their pitch would presumably seek to participate in some way — which is not discussed in the plan — in the development of the Democratic governor’s proposed system of electronic tolls that would collect hundreds of millions of dollars a year. Major engineering firms have made large sums of money performing studies and planning for construction of such tolling systems in other states. There’s no mention in the proposal of who would pay the consultants’ team, but it appears that at least part of the money would come from firms that might be involved in the tolling project. Whether or not this particular proposal goes forward, the document provides an insight into the strategy and execution of campaigns to approve big legislative initiatives, which can be lucrative for people and companies that work in conjunction with the government on such projects. It plots how to marshal support and overcome opposition. It illuminates the sort of political business that gets proposed outside of public view, and is often consummated between private interests and the people’s representatives. Lamont has already signaled he would be open to such ideas, having said on March 7 he is exploring bringing in private investment to help pay for constructing electronic highway tolls through a partnership with the state. The state would eventually issue a request for proposals to get specific plans from businesses if tolls win approval, but details of the public-private partnership have not been worked out. The consultants involved in this new proposal are experienced and have built up many years of familiarity with the Democrats who control the governor’s office and legislature. They clearly have perceived the obstacles that the new governor has created for himself in his first big initiative — after promising repeatedly during the campaign that he’d only toll trucks, not passenger cars, and now going back on that pledge less than three months after taking office. “Government Relations Tactics” would include: showing legislators “how money earned via tolls can significantly improve their specific districts — driving the correlation between tolls and local improvements to infrastructure; highlighting the “vs.” factor by using “polling data to share statewide how CT residents feel when you compare tolls to an increase in gas taxes, property taxes, car taxes, etc.” and providing “legislative leadership the necessary political data to ‘whip’ their caucuses” into support for tolling. “[D]oes this data exist for Republicans?” the document asked. Lauren Amaio, director of digital communications for Global Strategy Group. 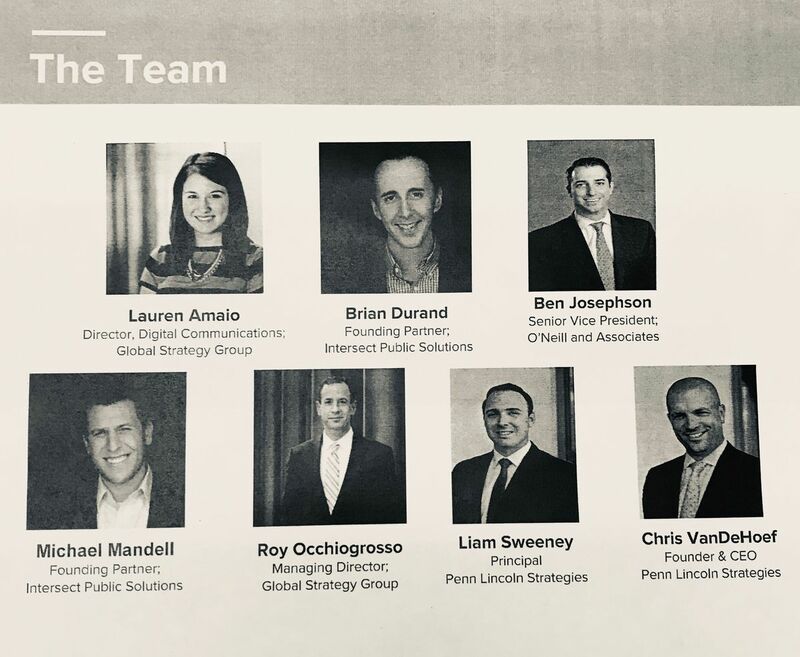 Durand, who was chief of staff for Malloy’s final few years in office, had worked prior to Malloy’s becoming governor with Occhiogrosso at Global Strategy Group. In January, after Malloy’s term ended, he launched a new consulting firm, Intersect Public Solutions, with Michael Mandell, another Malloy alumnus. Mandell, a former executive director of the Connecticut Democratic Party, was Malloy’s deputy re-election campaign manager in 2014. Josephson registered as a lobbyist in Connecticut about a week ago for HDR, an international firm that provides engineering, architecture, environmental and construction services that has Connecticut offices in Glastonbury and Cheshire. HDR has experience in tolling, having performed a major study on that subject in Indiana in the past couple of years. It says that its staff is “experienced in progressive technologies such as open road tolling and adaptive traffic control systems that provide you more options in managing your projects and budgets.” Josephson is expected to be paid $72,000 this year by HDR, according to his lobbying registration form. One possibility Lamont has mentioned to pay for development of tolls is that private investors could provide upfront money to construct an overhead toll system before motorists start depositing hundreds of millions of dollars a year into state coffers. The construction costs for Lamont’s plan — which includes tolling all vehicles on I-95, I-91, I-84 and Route 15 — are currently projected at $213 million. Tolls would not be fully implemented until the 2025 fiscal year. They would raise about $800 million a year.